Always looking for better ways to serve you. Be the first to share your favorite memory, photo or story of Oris. This memorial page is dedicated for family, friends and future generations to celebrate the life of their loved one. Oris Howard Hoover was the second of four children born to Laura (Mikkelsen) and Chris Hoover on June 16, 1920, at their rural Exira home. He peacefully passed away on November 27, 2018. Soon after his birth, his family moved to a farm west of Guthrie Center. He received his education at Baker #2 and Guthrie Center High School. He was baptized at the United Methodist Church and later became a member there. Oris enlisted in the United States Navy in 1941. He received his boot training at Great Lakes Naval Training Station in Chicago. His next orders took him to Ford Island, Honolulu, HI, for two years. On July 27, 1944, Oris married Velma Jorgensen at the Methodist Parsonage in Guthrie Center. They moved to Alameda, CA, where he was attached to Fleet Air Wing EIGHT and did engine testing during his remaining service. At the time of his honorable discharge, he had achieved the rank of aviation chief machinist’s mate. He was proud to be a World War II Veteran. In September of 1945 they purchased a farm near Monteith. He loved the independence of being a farmer, and he was a good steward of the land. Oris and Velma had a general farming operation with grains, hay, hogs, chickens, and cattle. He was especially fond of the Polled Hereford breed. Two daughters, Barbara and Beverly, were born during this time. After 40 years of farming, they retired and moved to Guthrie Center. Oris enjoyed his family, traveling, hunting, and rarely missed Exira’s Fourth of July celebration. He served 20 years as a director or board president of the Guthrie County REC. Oris also fulfilled a term on The New Homestead board. 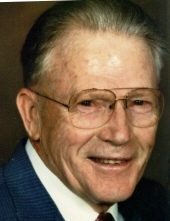 He was an active participant in Guthrie Center Lions Club, and he was a lifetime member of American Legion Post 124. Oris was predeceased by his wife (2008), his parents, one brother Dalton and two sisters Opal Hoover and Norma Sheeder, and son-in-law, Sam Steensen. He will be lovingly remembered by daughters, Barbara (Gregg) Saltsgaver of Redfield and Beverly Steensen of Guthrie Center, 5 grandchildren, Lisa (Chris) Rhodes, Scott (Maren) Steensen, Melia (Eric) Van Meter, Nicole (David) Miller, and Peter (Amber) Saltsgaver, 8 great grandchildren, Samuel and Kiersten Steensen, Olivia and Emerson Van Meter, Saoirse and Celeste Miller, and Nora and Adalynn Saltsgaver, sister-in-law Mary Lou Hoover, and other relatives and friends. To send flowers or a remembrance gift to the family of Oris Howard Hoover, please visit our Tribute Store. "Email Address" would like to share the life celebration of Oris Howard Hoover. Click on the "link" to go to share a favorite memory or leave a condolence message for the family.